Challenge: To produce a set of individualised counters that would be suitable for use with a specific board game. single letter on display on it, as shown in the photo. Group two opted for non-descript counters with the intention of spray painting them later specific colours. The students in group three opted for large pieces with a bird theme on the top and other animals that fitted with the style of the game. Level of Difficulty: Low - students were producing a basic design piece that needed little adjustment the group three item was slighlty more complicated but only took ten minutes to design the others were under three. Timeframe: For group one the total print time was forty five minutes. For group two the print time was thirty minutes. For the third individual piece the print time was ninety minutes, although significant reworking of this deisgn was required as its base was to large. Size: The small counters were 20mm across and 5mm high. The other (third) design of the individual bird was 50mm across and 30mm high. This was going to be considerably reworked to ensure that it was more manageable. What we would do differently: This was a short term print and a short term design project designed to work with small groups collaborating together to produce something simple. More complex designs were possible (as opted for at least one group) - and this post will be updated once the other groups have completed their designs. Board game with Group One designs compared to the size of the board. Larger piece from group three shown on the board illustrating the size relative to counter designed. 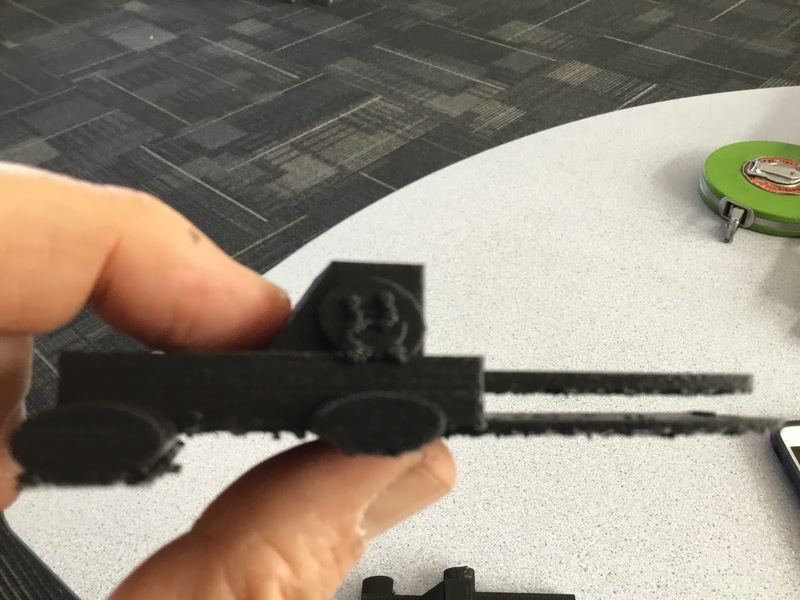 Challenge: For students to design a working bookmark. Background: As detailed previously the challenge was to produce a working bookmark that stood out or had a 'wow' factor. This was given to the entire class as a task. 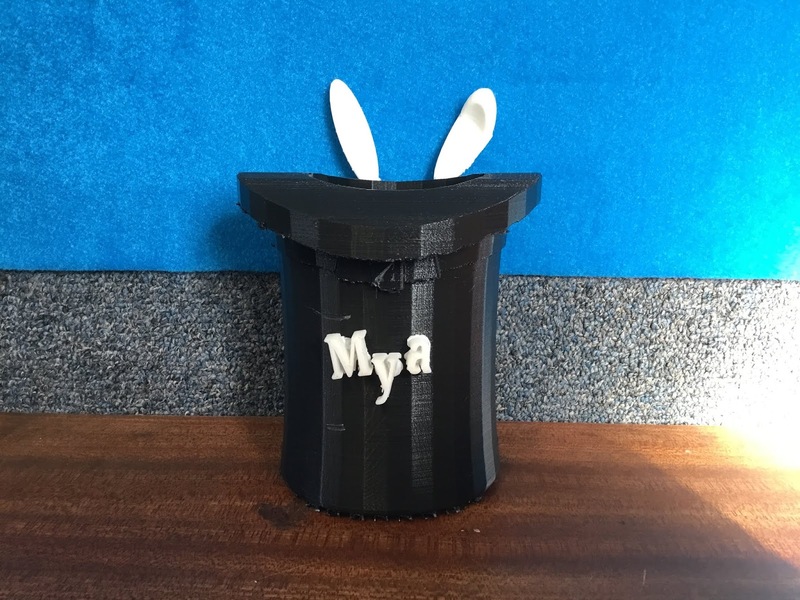 Students were instructed to create a design, come up with an idea and the best working ideas with the 'wow' factor were in turn created as 3D Designs. The designs presented here were some of the prototypes for the final projects. Left: The initial Lollipop design shown on the left consisted of a stick that needed to be redesigned, made thicker and stronger and a significant improvement needed to be made to the clip to hold the pages in place. The print took two hours, the item was themed as a Lollipop as the student felt that the novelty factor of the item would work as a book mark. The size of the print measured 150mm long, was 60mm across at the top of the design. The initial design of the clip on the print was 20mm and the revised version of the print saw this reduced to 10mm which worked better as it maintained a hold over the pages. The student has shown considerable talent in an artistic sense and is continuing to look at pushing her designs. Left: A 'Star Wars' themed book mark. As the student was wanting to design something from scratch featuring an iconic design from the series, going with a 'Tie Fighter' design as he could replicate this easy within the design page from Tinker cad. This bookmark measure 70mm across and was 50mm high. The clip that was designed to hold the book pages in place was initially 40mm high. The student wasn't happy with the visibility of the Tie Fighter so in subsequent designs it was raised higher in the design. Left: As shown in the subsequent designs the student has altered significantly the design to accommodate being able to hold the pages in place. The clip can be seen in profile below. 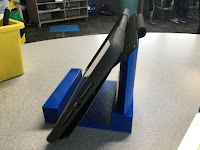 The initial design featured a flat attempt at holding the pages in place, students needed to get the concept of a 3D clip that would work, and it took the students to see the designs that failed for this concept to be realized. The print time being two hours, the design itself needed to have no adjustment from this point. book in place were all based around some variation of this design. 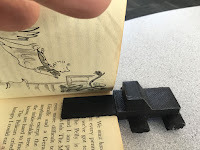 An important part of the process was getting the students to be aware of the need to produce a 3D aspect to the bookmark that would not damage the pages (as some prototypes did). This would not have been possible without the prototyping process which showed that the original designs were not going to work. Challenge: To produce a working 3D Printed Bookmark for student to use with a regular book. 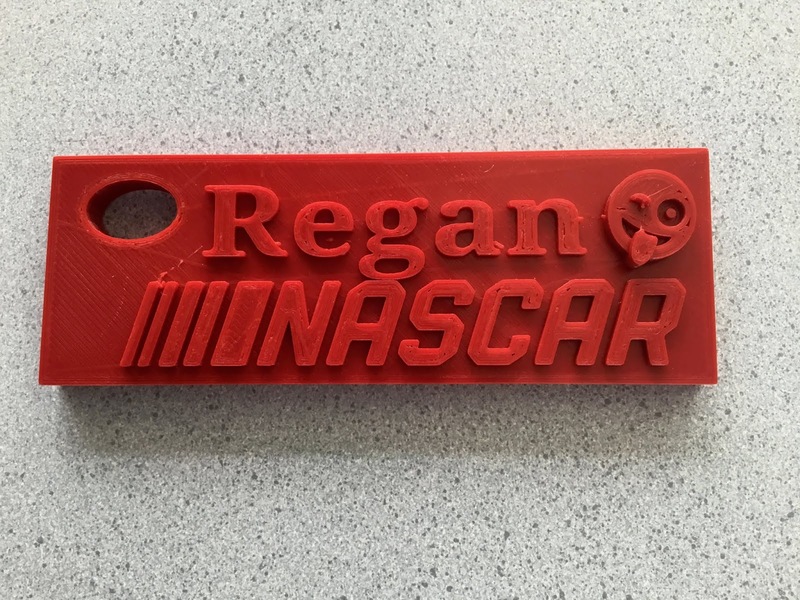 Background: Inspired by a generic challenge that was set/sent out with examples of 3D Printed Bookmarks. 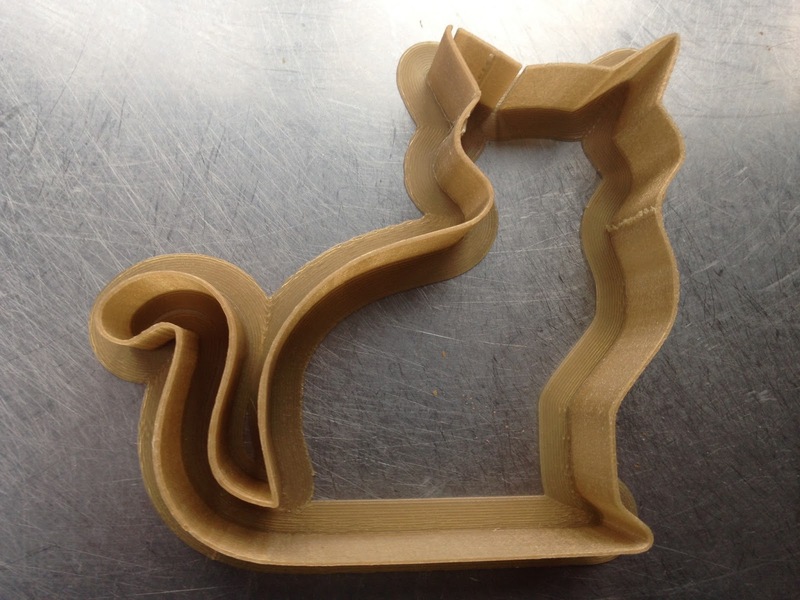 These examples had been produced by adults but they were used as examples that were given to the students in the classroom and the student were asked to produce their own designs. A focus need to be made on producing a workable bookmark that could be used to hold a position in a book. This example originally had a single block that was thin and intended to hold the bookmark in place. 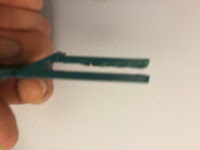 When this was trialed it was discovered that it did not pin or hold the page in place and slid out. The student then designed a pin/clip to hold the bookmark in place. Key to solving this issue was the width of the clip relating to how many pages that it was intending to hold in place. The student was experiementing with 3D Design and has a strong design ethic and ideas, although this student, who is nine was producing his first significant individual 3D Print. In the initial design there were issues with the clip although the student had the basic premise and idea correct. He also decided not to over complicate the design of the truck, keeping a basic shape without additional decoration. Level of Difficulty: Medium. Once the shape was determined and the concept had been discussed the student created a sketch of a plan. 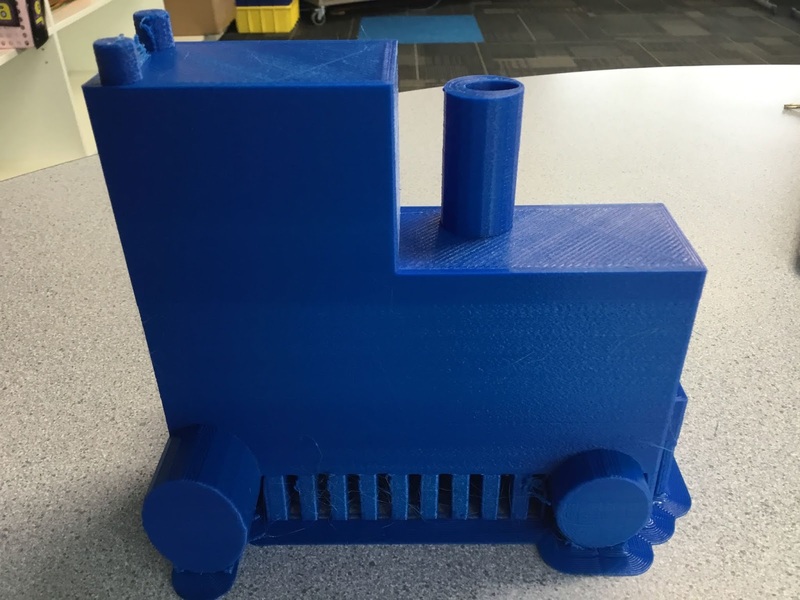 The 3D Print required significant alterations for the print to be considered successful, however by printing a first version it alllowed the student to clearly see the modifications that needed to be made. Timeframe: Two hours forty minutes. This was the ideal print to complete a 'draft' print for - given its size and dimensions. Size: 100mm long, 30mm across and 20mm high. Suitable for the realistic size of producing a bookmark for a regular novel book. The portion of the design that was inserted into the book itself was a clip/double bar that was 40mm long. What we would do differently: Very little - this project already had the reworking completed by the student between the first and second prints. The final adjustments made to the print allowed a short term print to complete the task that it was intended for and complete the challenge. Above: Original design with props. Challenge: To create a farm accessory to work as a hay feeder. The print needed to work in conjunction with a number of other items such as hay bales and model to scales cows. 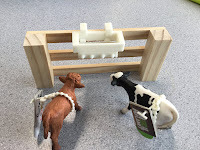 Background: Following the success of the students who designed the four and eight calf feeder designs for the farm toy business the students decided that they wanted to target the next item on the list which was a hay feeder. This involved creating a base with bars and a cage. The students who designed this originally decided to create it as a single piece and as a result there was significant amount of rafting. As a consequence the removal of the rafting was relatively difficult - there was a bar that was popped out when it was removed. The students were then faced with a challenge - how to produce the cage without having to produce so much rafting. 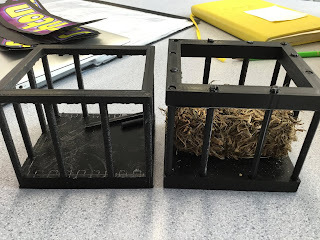 The solution which they came up with was producing the cage in stages, first as the base and the top, with the second stage being the base of the platform having holes in it which the poles could then be inserted into. This was a slightly complicated process as it involved including the depth of the poles into the base etc. However the students were able to half the printing time for the project and remove the need for rafting. 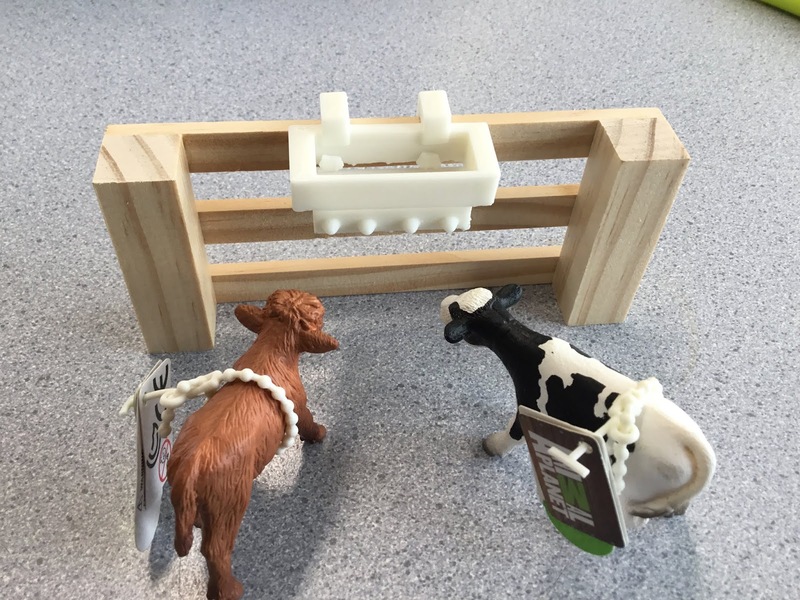 The students are again creating this prototype as a potential commercial project for a company that produces farm themed toys and sells commercially. Level of Difficulty: High - this is producing a product that is potentially going to be made commercially and requires the base, base and top level to work in unison. It has required considerable reworking to get the measurements and design to a point that it would be considered to be completed. 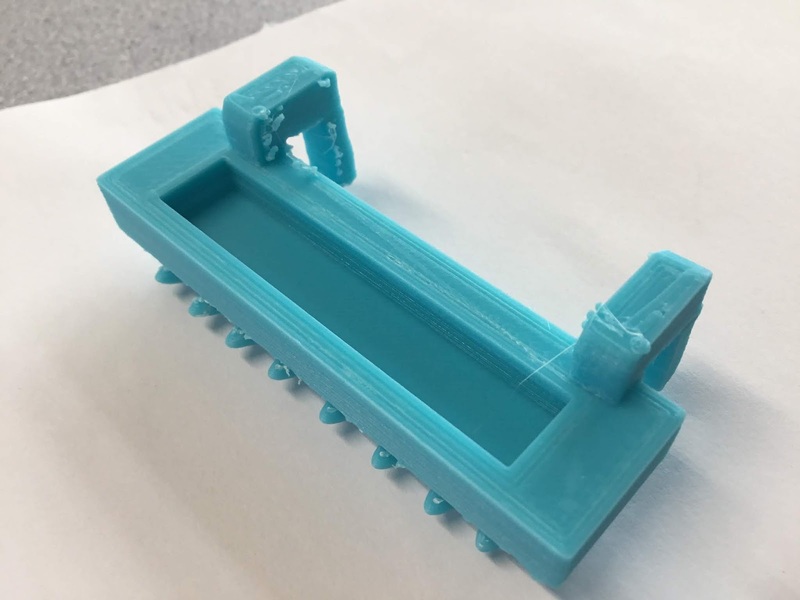 This has stretched some of the top design students in the classroom to their limits to complete it with the minimum amount of printing required. Time frame: The original design that was a one single piece design had a significant piece of rafting and had a ten hour print time (see photo left) the revised version with the students creating individual bars and a separate base and lid was five hours total for all of the parts of the project. This second version has virtually no rafting and therefore would be the direction to move in the future. The normal default settings apply as always, which is an 8mm nozzle and 20% infill. Size: The design measure 90mm across and was 80mm deep. The design was 60mm high and the top frame had a 10mm box design as its framing. Relative to the design of the hay and other animals this fits perfectly with the expectations for the design. What we would do differently: The students underwent an extensive revision process to get this design correct including considerable reworking, measuring and development. Little additional design is required with the exception of a stand for the cage, as it has one in real life. The students themselves were the ones that drove the improvement based around the printing differences between version top left (ten hours of printing and considerable additional rafting to maintain its shape and form). The second reworking of the design and print involved the bar rods being printed separately and featured and insert in the base, you can see this clearly in the photograph of the print with the bar removed shown in the top right hand photo. Left: The two designs side by side. The ten hour version shown on the left, the five hour version, prior to the super gluing on the right. 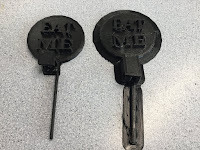 The two designs are nearly identical but the students by breaking the process down and printing as component pieces instead of a single block design have halved the time that is needed to produce the project and reduced the amount of PLA (plastic) used in its production by nearly half. 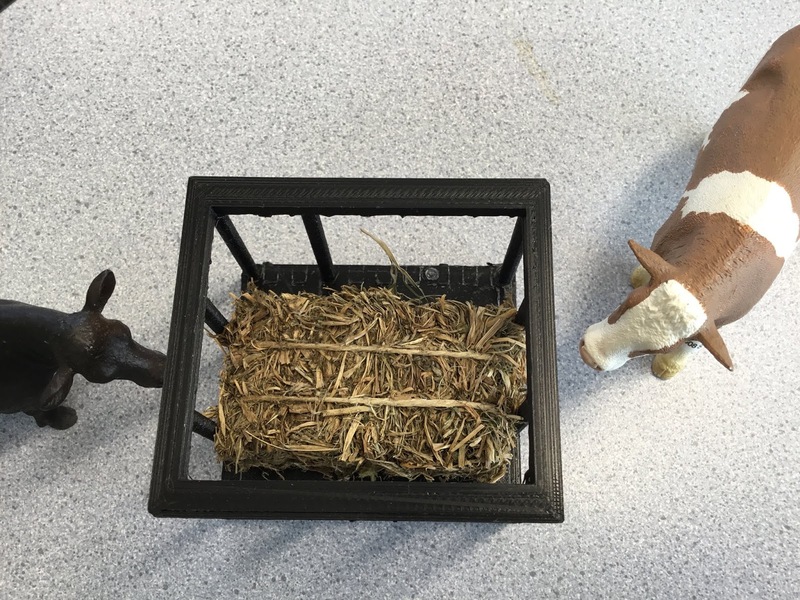 Challenge: To produce an authentic to scale model of a calf feeder that was capable of feeding up to eight cavles at one time. Background: This is the second version of this project. In the inital version on this blog the student had produced a four calf feeder which was for potential use with a commercial business. This model had to be produced as detailed in previous post. This has taken number models and prototypes until the 'four feeder' was successfully produced. The next step was to change the colour varation, which is a simple matter of changing the print colour and then increasing the size of the print. 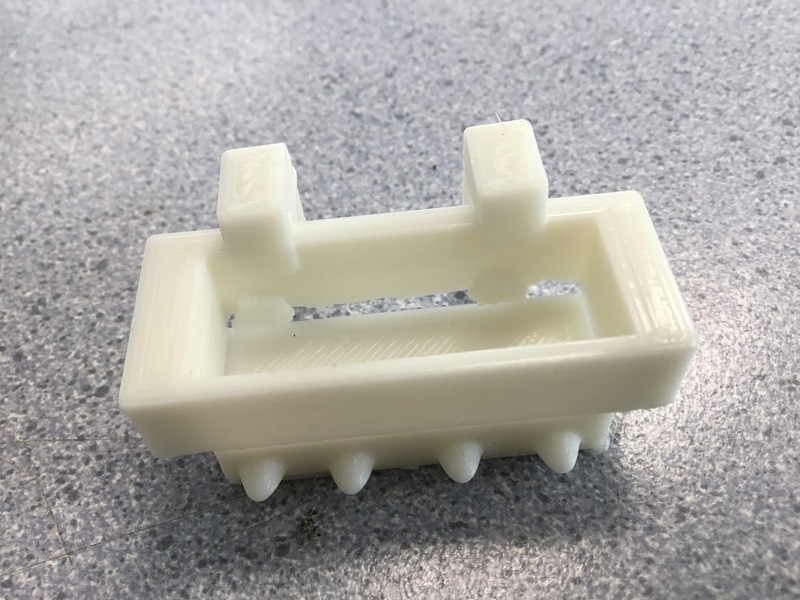 This has involved significant testing and reworking to get the dimensions to scale - as this is is a potential collaboration between our school/students and a local business creating something to use with existing products not easily available on the market. Level of Difficulty: High - this is a precision piece that needs to work to a specific size, be mounting successfully on a model fence and meet the needs of the cow models to interact with. There is no margin for error and this requires precision, which has been a positive if challenging experience for the students. 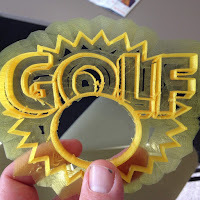 Timeframe: Two hours - this has been produced with a 8mm nozzle which is our default size. Consideration has been given to reducing the size of the nozzle to increase the quality of the print. Size: This print is 80mm long and 25mm wide. Crucial to the success of the print has been the hinges at the back which have been designed by the students. These have allowed the feeder to be clipped into place on the fence. Students have been experimenting with producing the best fit design to do this. What we would do differently: Our students are having a meeting examing the commercial aspects and considerations of mass production, they have identified a potential fault with the design and want to look at the considerations of its use (as a toy) relative to the strength of the print (specifically on the hinge that they have deisgned to hang it to the model fence. 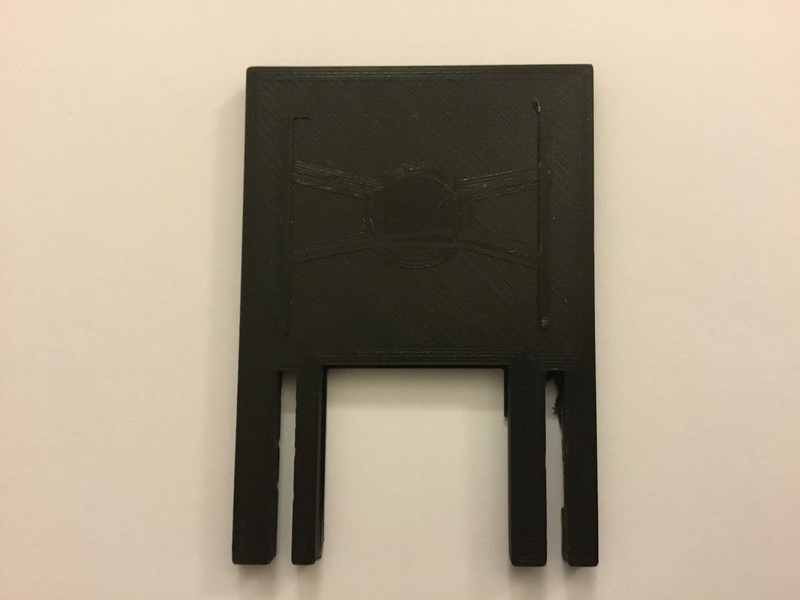 As noted there is a potential issue with the size of the nozzle as well - it may be a print that we produce a higher quality print with my reducing the nozzle size. Above: Design shown in full. Background: A local business which we approached as part of an initiative by supplying them with an oversized business keying. 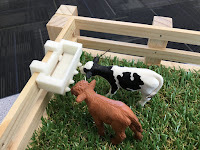 The business then asked to produce an additional item that would work as part of a larger set, working in conjunction with a fence item from the set, also in conjunction with a number of items that interact with it model cows and other livestock. The item concerned is a copy/model of an actual item that is used in the feeding on young dairy cows. 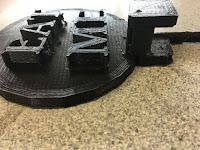 Level of Difficulty: Medium - this print is very deceptive while it is small in size it was built from scratch by the students involved, had a very specific purpose and needed to work in conjunction with other items. Time frame: Just over an hour. 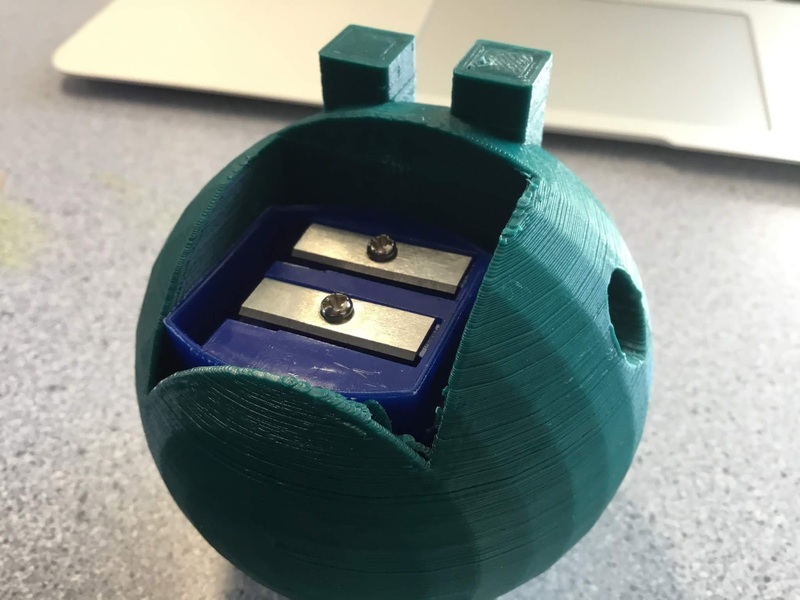 This is the prototype for this item and it may go through some basic revision (see below) however the students have succeeded in completing the brief an designing something to complete the challenge. Size: 50mm wide, 30 long and 25mm high - as this is a potential business partnership project to work with other items (see photographs) so the size needed to be perfect. The other important consideration was that it needed to be mounted on the fence for the animals to use. What we would do differently: This design needs slight adjustment. 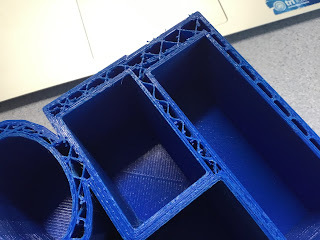 There is a visible gap at the bottom of the design that needs to be addressed for the final print. In the initial designs there was the thought that there was an ongoing issue with regards to the bar that was attaching the design to the fence. However as part of the business there is a feeding set including artificial grass. When the models were used with the artificial grass the height of the models relative to the calf feeder fitted perfectly. 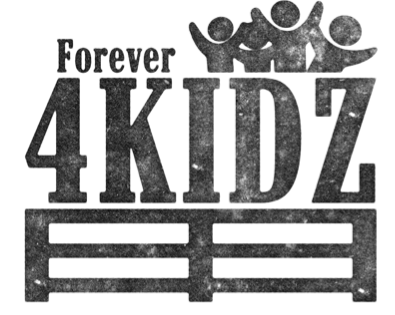 This is the students first attempt at this design and will require some refinement (which will be shown and shared on this blog). Student to produce an original name badge that could be used to identify their property or themselves (for instance a label for their bag). Background: An introductory challenge to our students. 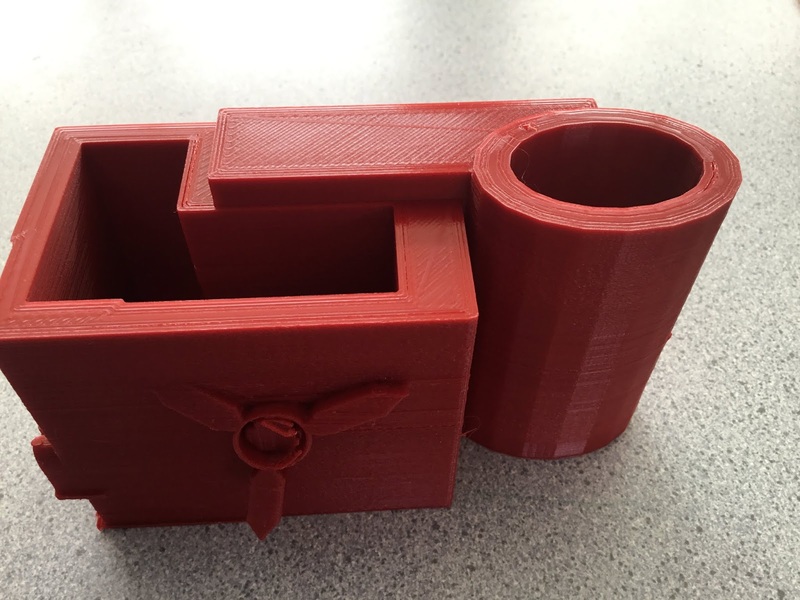 This is something for a student who has not produced previously anything using a 3D Printer. 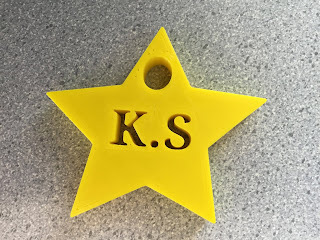 The idea was to produce something that would be basic that could be easily produced and allow the student to be successful, leading to them developing further 3D Printed ideas. This student went further, producing a pair of 'racing stripes' that provided balance and depth to the print. The student was thrilled with the result - a large numbers of this print and variations of this task have been produced - however I would rate this amongst the best in the series in the past few years. The result had the balance between practicality of the design, being able to be produced as a print and it working - without it being too elaborate, and the size of the print. 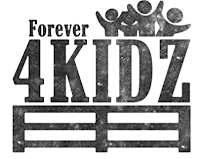 As mentioned on this site essentially one printer is running non-stop in a single classroom of twenty seven students to produce as many prints as possible. Level of Difficulty: Low - this is produced in five steps, students are currently editing a video which explains these steps as a 'how to' tutorial. The student mastered this concept easily (it also should be pointed out the student involved is seven years old. Timeframe: Two hours. This print benefitted from having the stripes which reduced the print time. 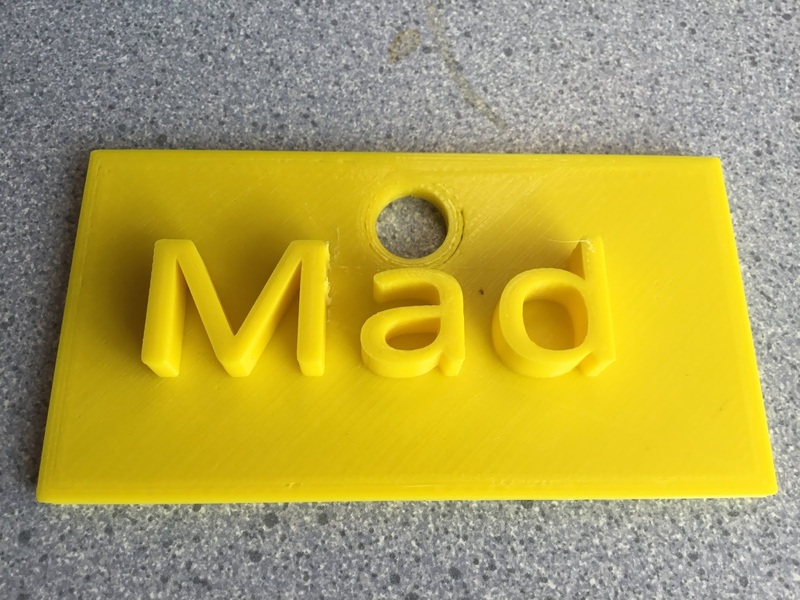 The choice of font size also reduced the amount of filament in the final design and print. To balance the affect of the design its size relative to its role etc was nigh on perfect. Size: The dimensions of the design measured 130mm across, 50mm high and had a width of 5mm. What we would do differently: Other than possibly a different base PLA there is very little that we would change. 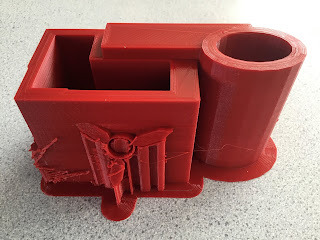 The final product could have potentially been spray painted, however the student was extremely excited with the design and no further adjustments was required, hence its exemplar status. Challenge: To produce something for a local business that would have a practical use. Background: We are looking at ways to get the work of the students out in the community to use the technology to increase awareness of our students work and also expose the student to real time business experiences. One of the ways that we are looking to do this is to create and produce unique items that have a practical use for local businesses for them to use. One of our key designs that has had a practical use in the classroom and around school has been oversized keys. 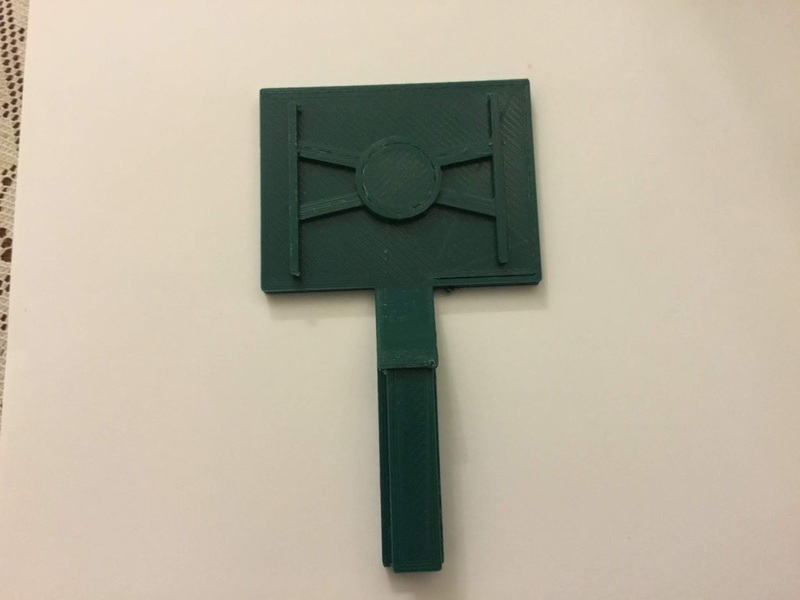 This has primarily been used as a technique to ensure that important high use keys are not misplaced by staff or students (by making the keyring with the key so large that the key cannot be easily placed in an individuals pocket either student or staff). We followed this same principal when we considered local businesses that were in our area and something that we could produce for them to create a 'buzz' or interest in our school projects. The students decided to target a number of local businesses or places of interest (local Library, shops etc) and look at producing a key ring for them. The rationale was that this would be producing a high use item that a number of adults or part of the community would be handling on a regular basis. We have targetted the use of the 3D Printer to do this and not the school laser cutter as these items are being handled repeatedly and potentially need to be cleaned. 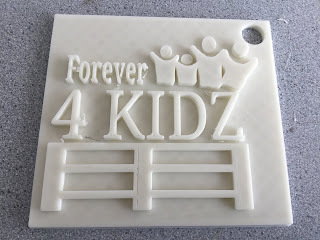 We have generally found that the wood when laser cut can be marked and stained from use by people. Level of Difficulty: Medium High - we were producing something that was original from scratch but was copying a specific logo or design this meant the specifics of what needed to be created were very particular, as a result the design needed a high degree of accuracy. Timeframe: Eight Hours - this is long for a keyring/badge however this was delibrately oversized so that it became a talking point for the business. Size: This oversized design. It measured 140mm across and was 130mm high. It was 5mm thick. The design and the lettering raised 5mm above the base design. Given the brief this was delibrate. What we would do differently: If you compare the original design above right to the creation above left you can see that there are some slight variations between the two designs. The fenceposts are equal and meet in the middle, in our students design the middle is at the 1/3 and 2/3 point. 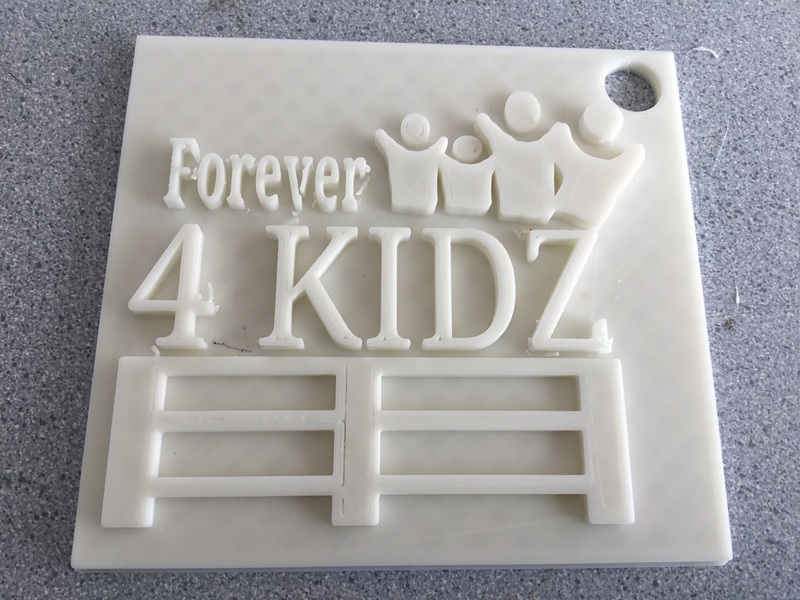 The family design as part of the keyring differs slightly from the original as the students created it from scratch and they could have had a universal design for the head of the shapes. This is slightly oversized however this was the intention. Challenge: Student had created a badge for his first 3D Printed project. Student was challenged to create an original print, personalised that would have a specific purpose. Background: For his second project he wanted to create an iPad stand. He designed a project based around this and personalised it with his name. The dimensions of the print were designed to include storage and an option for including additional items. 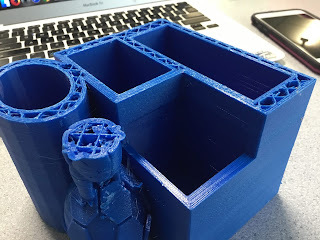 The student was working from scratch and measured all of the dimensions for the print (see below). Level of Difficulty: Medium-Hard: the student was stretching himself for the first time with a design that had mulitple aspects to it, all of which were needed to work in conjunction with each other. He add limited assistance from other students and the teacher to complete the design. The student is nine years old. Above: Same view with rafting removed. Timeframe: Twelve hours. Aspects of this print meant that he had not properly considered the design aspects of the size of the print. However the stand itself works (see below) and as a result the timeframe to successfully complete the challenge works. Size: The design measures 130mm across and 120mm deep. 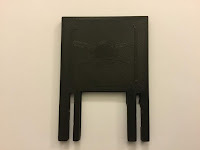 The thickness of the design was between 10mm and 5mm depending on the aspect of the print. The height of the print was 70mm. As a result of the task these dimensions were successful to complete the task. What we would do differently/next steps for students: The student included their name on the design and included a propellar on one side. These were printed in a single colour and could have been completed seperately to given the affect of colour. The name of the student inclued a lower case letter and should have had a capital. Under one section of the base there was a raised point of a print. Given all these aspects the key consideration was the brief - to produce an iPad stand. This was successful despite reservations about the size of the design as shown on the left. Background: Over the past few weeks we have engaged a new group of young students in working on basic 3D Printed projects, in many cases for the very first time. 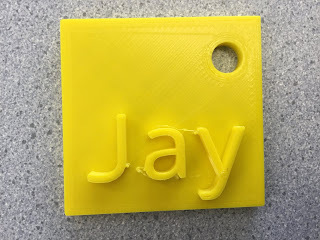 To engage students with the technology the first task for most students is a basic name badge, which can be completed in three basic steps. For students creating for the first time these can be powerful examples to introduce the technology and the concept of design. Most of our students are using Tinkercad for their design on the basis that its straightforward and the students (who are nine and ten years old) are able to manipulate and create designs. The first designs tend to be basic without a very short design brief which the students are able to master nearly always at the first attempt. 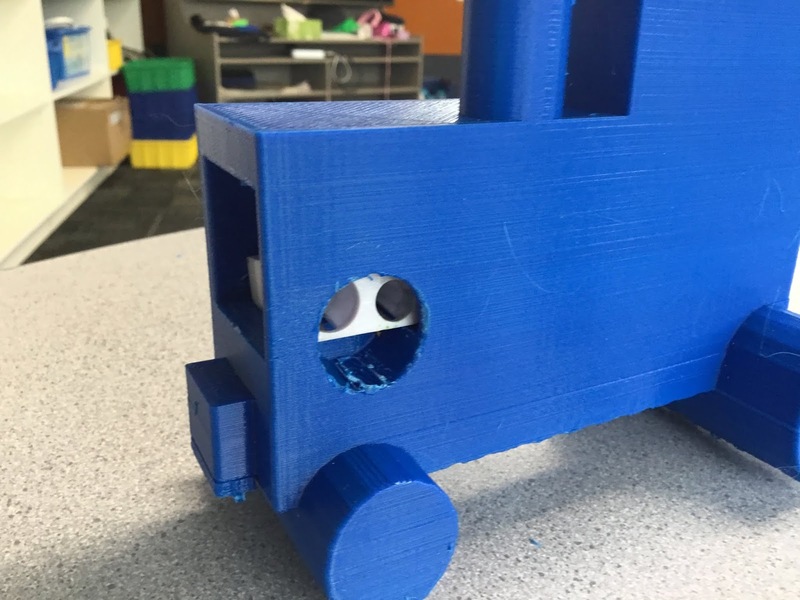 The next steps is to move students onto more advanced projects. These examples here are the second runs from this series each of them has an increased print time of six hours to reflect their relative size. Considerable time is spent with the students prior to printing. There needs to be an identified purpose and an original or personalised design. The students are encouraged to think about the scale of what they are completing relative to the design in question. The print shown left is intended as a stationary storage device. The student designed it from scratch using a rectangle as the base, and then adding a cylinder and a cube for storage on the top of the box. The student then met the brief of 'personalisation' by adding his name to the side of the design. The print time for this design took six hours however the student hadn't considered the overall size of the design relative to what he wanted to accomplish. Some stationary is able to be stored by the design, however when too many pens or pencils are placed in the design it is unable to cope with the weight. The student is going to redesign this and triple the size of the design to meet the storage needs of it. 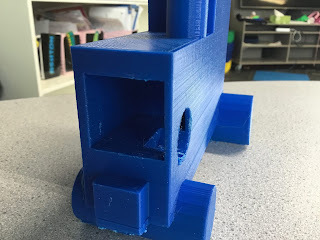 He is shown a little confidence in Mathematics and practical measurement (Tinkercad includes detailed measurement options) and has a desire to complete this project to the correct scale - this is his second ever project with 3D Printed Design. Left: A second design from another student, with a similar design and scope. 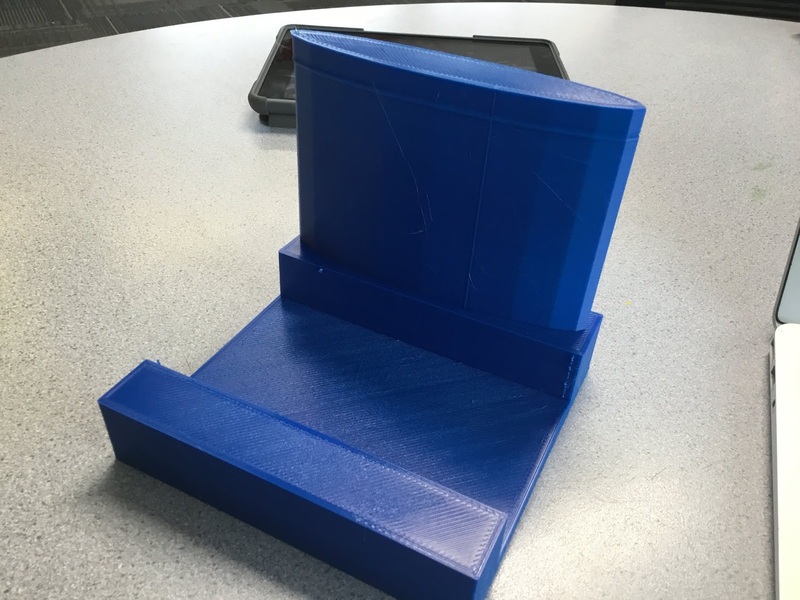 Again the student wanted to create a storage option for stationary to use in the classroom. The print had a six hour timeframe for completion - again the size of the project was intended to be for storage and the student needed to consider this as a prototype and redesign it relative to completing the brief, something in the region of eighteen to twenty hours if other similar prints are to be considered. 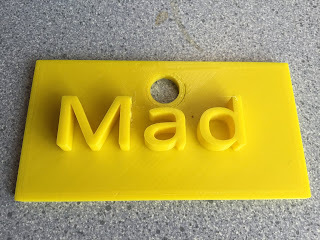 Left: Student wanted to create a significant name badge or plate. In this case the student wanted an imposing 'Nascar' themed name plate. The design featured a six hour print run - a length of 180mm and width of 60mm. The print was 10mm thick. Its initial design was as a key ring, hence the hole that was created in the design in the top left handed corner. We will be putting these prints into a specific presentation with tutorial videos explaining the process, including tracking the progression of each of these prints and the development of them from the students perspective. Background: In New Zealand the school year runs from February to December. Different schools have different patterns of class students depending on numbers and details. In the case of the classroom where the students are currently based roughly half have been in the classroom for 2018 and have had a 'good' level of exposure and practical experience with 3D Printing. The other half of the class are novices and for these students basic design and ideas need to be started with slowly. The projects completed here were produced on the basis of students using the technology for the first time and keeping design, print times and size small and simple to allow the students the opportunity to create and then reflect on the process and creation. 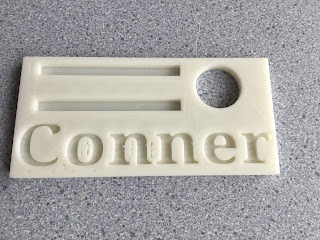 A basic name plate for a student to make a label that could be used to indicate ownership of a bag, hold keys etc. This is a very simple design and idea (which takes three simple steps in Tinkercad) and the print time was minimized to two hours. The designs dimensions were based around a simple shape of a 80mm square, names 10mm off the plate and the only additional feature was the hole to attach the name badge or key ring. Essentially the same design and process with the exception being the base design shape which was a heart instead of a cube. 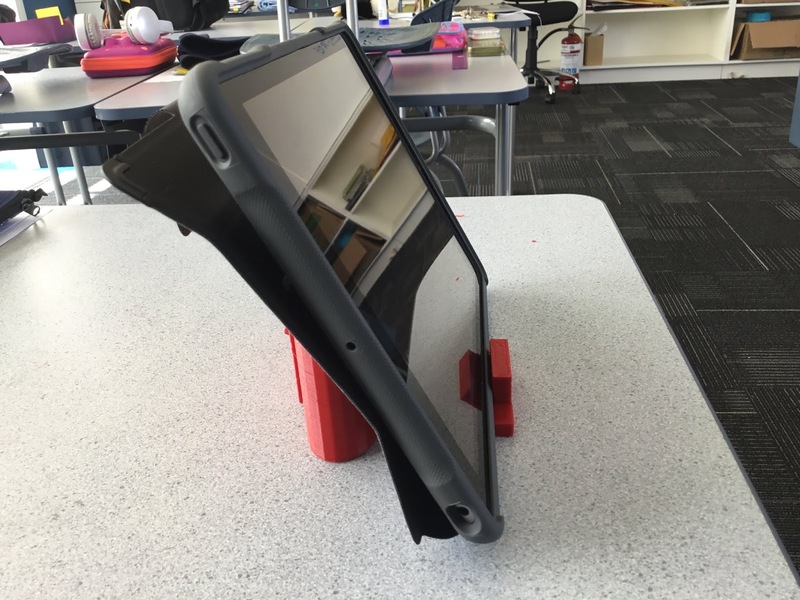 A different colour with the PLA was reflected in the availability of material rather that the choice of the student who created this. The student shortened her name to ensure that it fit easily on the design. A simple, basic yet effect design that could suit students of a particular age or be useful for labelling. A three step design process. A further slight variation, featuring an actual student nickname to ensure that the design fitted well in the confines of the design and shape (which was 80mm across). 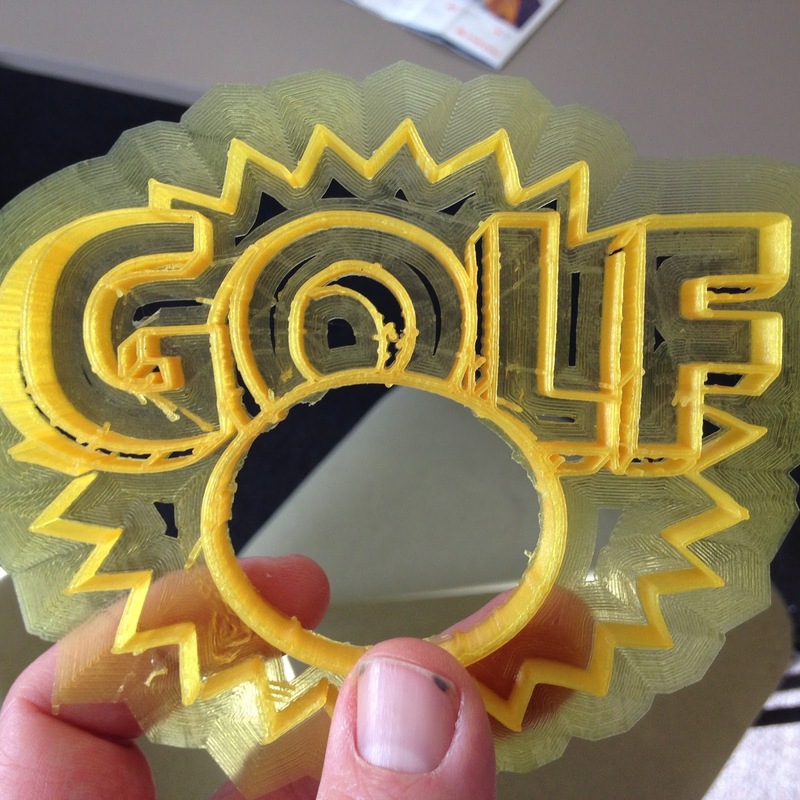 The width of this design was 5mm to ensure a minimum print time, which came in at just under an hour. Student was creating for the first time as a nine year old, who had seen others creating projects and this is intended as a stepping stone to more advanced projects in the future. Left: Similar to the basic designs above but as the first shape the student choose a star for the background. Given the length of the first and last name of the student, the student made the decision to use her initials for the design - she deliberately choose to include one 'dot' between her initials for the balance of it, rather that the correct format of her initials. 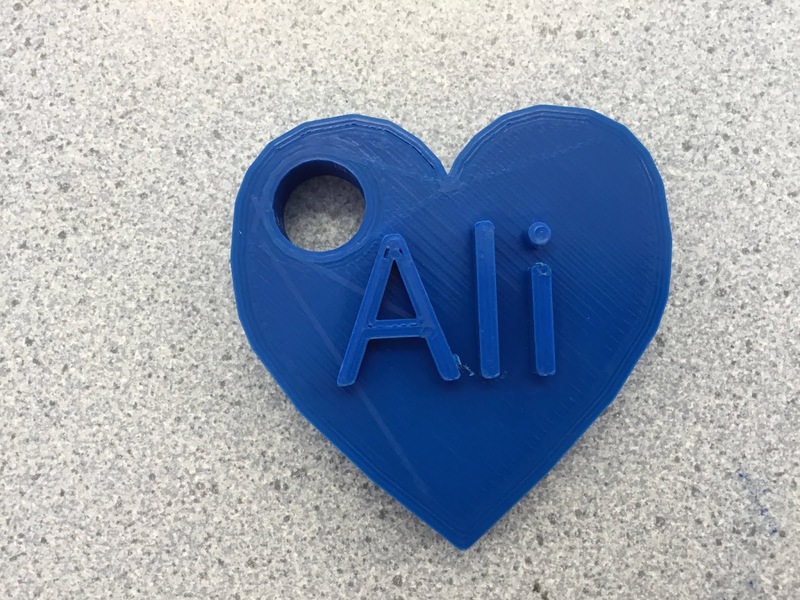 Again this is a basic three step process to design something for the first time and print it to encourage and get a student thinking about where to next. This is a one and a half hour print completely student designed by a nine year old. Shortly we will be creating a Google Slide detailing some of these basic prints and producing them with a tutorial relating to the New Zealand Digital Curriculum Levels and Exemplars.